Hadimba Temple: Built in 1550 A.D. in a forest grove. Hadimba Devi's temple is fourtiered with a pagoda shaped roof and a front door way covered with figures and symbols. The temple is dedicated to Hadimba Devi, wife of Bhima the pandva and is situated amidst the lush green and thick whispering forest of Dhungri, just 1.5 km. away from the town. 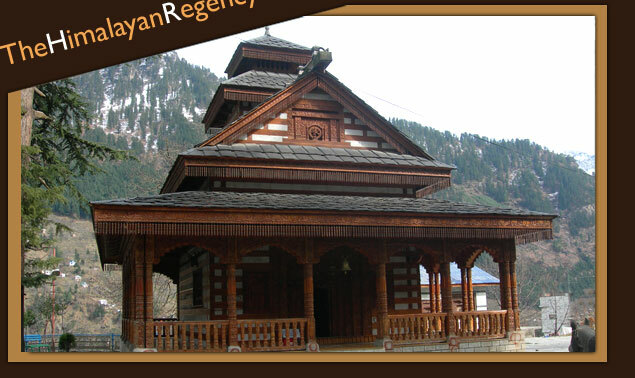 Siyali Mahadev Temple : A temple is very old & famous in village of Siyal dedicated to Lord Shiva. Tibetan Monastery : A small monastery in a peaceful clerring has image of Buddha & some exquisite tangkhas. Famous for carpet weaving & Tibetan handicrafts. Van Vihar : Forest walk & Boating etc. Vaishno Temple: A small cave and shrine with an image of goddess vaishno devi. Other temples are dedicated to lord Shiva, Rama and Krishna. Kasol Valley: Charmingly located on open space with slopes down to a broad expanse of clear white sand at edge of the river Parvati. Manikaran: Famous for its hot water springs on the bank of the river Parvati. The water is so hot that Dal, Rice etc. can be cooked in it. A well known pilgrimage place on account of ancient Hindu Temple & Gurudwara. According to a legend Manikaran is also associated with lord Shiva and divine consort Parvati who lost and recovered her earring here. Kothi: Kothi is quiet but picturesque spot at the foot of the 13,400 ft. mighty Rohtang pass, about 15 km. away from manali of the famous Manali-Keylong Leh highway. Gulaba Camp: A picturesque spot rich in herbal plants & flowers. Its beauty is to be seen to be believed. Rahala Fall: About 27 km. from manali, at the start of the climb to the Rohtang Pass, are the beautiful rahala falls at an altitude 2,501 mts. (8,500 ft.) mother nature excellent creation. Marhi: Marhi is the last stop on way to mighty Rohtang Pass, located on a green terrace, is an ideal place to relax and enjoy nature. A picnic spot, par excellence. Ever smiling hotels, most of Tibetan origin are there to welcome you with open arms, offering food, drinks and snacks 24 hours services. Rani Nala: 46 km. from manali. It is a glacier point snow available during whole year. Rohtang Pass: The highest point on the road. It offers limited skiing but ample trekking opportunities at an altitude of 4112 mts. on the high way Keylong to Leh. The pass affords a wide spread Panorama of mountain scenery almost directly to the well defined sonepani glacier slightly left the twin peaks of the geypan. Solang Valley: A beautiful picnic spot. Nice meadows surrounded by tree of silver oak and spruce. Famous for international skiing slopes. Beautiful panorama of snow, enjoy horse riding and paragliding.